Sources: Statistics Canada. CANSIM table 051-0005. Estimates of population, Canada, provinces and territories, quarterly, July 1, 2013. Ottawa: Statistics Canada; 2013. http://www5.statcan.gc.ca/cansim/a26?lang=eng&retrLang=eng&id=0510005&paSer=&pattern=&stByVal=1&p1=1&p2=31&tabMode=dataTable&csid= – accessed July 24, 2017; and Canadian Association of Genetic Counsellors. Membership directory. Oakville, Canada: Canadian Association of Genetic Counsellors; 2013. 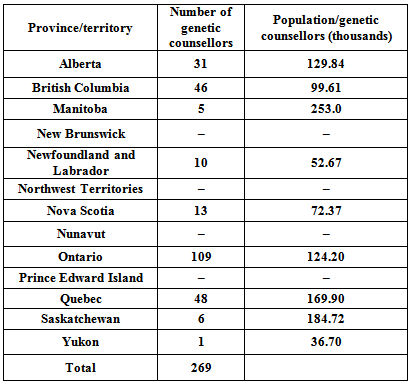 There are 269 genetic counsellors in Canada.1 This number includes all counsellors who are members of the Canadian Association of Genetic Counsellors – some of them serve specific populations. Access to these genetic counsellors and the services they provide is not equitable across the country. In British Columbia there are about 100,000 people per genetic counsellor. In Ontario that number is about 124,000; in Quebec, it is about 169,000; in Saskatchewan it is 184,000 and in Manitoba it is 253,000. Most genetic centres that employ genetic counsellors are in major cities. Therefore rural and remote regions of Canada may have limited access to genetic services except through outreach clinics and telehealth. There are no data describing wait times for children and families, nor for how many centres provide regular outreach, teleconferences or telehealth. It would therefore be helpful to address data gaps related to services, wait times for children and families and benchmarks for service standards.